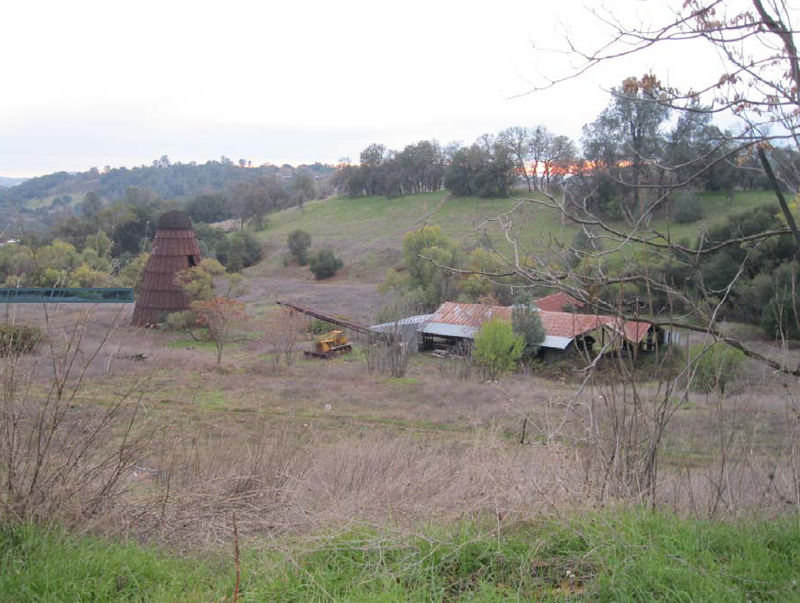 This may be more history than the reader wants to know, but it comes from a report by historian/archivist Judith Marvin of Foothill Resouces and was done to show that the site and mill had no historical significance and could be used for other purposes. We’re fortunate that Judith has done all this work and the editor could cut and paste. In 1883, all of Section 6, Township 1 North, Range 15 East, was owned by C. Miller, (Beauvais 1883). By the early 1900s, however, the land had been subdivided and the property on which the Whitt Manufacturing Plant was located was owned by Robert L. Price on the west and David Sanguinetti on the east (Thom 1907). The Sanguinetti Ranch was patented in 1873-74 by Jonathan F. Ralph. David (Davidino) Sanguinetti purchased the land in March 1880 for $4,000 from Jonathan F. and Esther A. Ralph. Sanguinetti became a well-known Tuolumne County farmer, providing a variety of produce to towns from Jamestown east into and across the mountains via wagon deliveries, as well as from a roadside stand on the ranch on present Sanguinetti Road. While David grew produce all his life, his sons Joseph and Henry became cattle ranchers (Brejla and Marvin 2006). The portion of the Sanguinetti Ranch that became the Whitt Manufacturing Plant was located on an adjacent parcel of land deeded to Joseph in 1918 by Eric Segerstrom who had purchased it in a tax sale after J.W. Taylor defaulted (Deed Books 5:754, 79:346, 80:570, 80:573). Beginning in the 1930s, Samuel F. Whitt and his wife Josephine Armario began establishing the Whitt Manufacturing Plant on present Hospital Road. Samuel Whitt was a native of Texas who came to California with his father to purchase land in Bakersfield. He grew up in Fowler, attended U.C. Berkeley, leaving there when he could no longer afford it, and went to work for the Union Pacific Railroad (UP) as a trouble shooter. Working as shop foreman for the UP in Merced Falls, he was hired by the Pickering Lumber Company to do some work and was hired full time on the spot. He moved to Standard and by 1930, was residing in Standard with his first wife Ruth and their son Edwin, where he worked as a machinist. He worked for D. H. Steinmetz until the Depression and then started his own blacksmithing and welding business on the Stockton Road in Sonora (present site of Savemart) (Whitt, personal communication 2011). His second wife was Josephine Rose, the daughter of Italian immigrants Lorenzo and Catherine Armario, who owned and operated an apple ranch in Soulsbyville (U.S. Federal Census 1930). Josephine married Samuel Whitt in 1939 and the couple raised three boys and one girl. In the mid-1930s the couple began purchasing land on Hospital Road (originally known as the Mountain Road, as it was the main road over the pass until the present highway was constructed), operating a blacksmith and machine shop on the site of the later box factory. In April of 1938, Samuel purchased five acres of the Joseph Sanguinetti property (Tuolumne County Official Records 5:295, 9:174), a parcel of land deeded to Sanguinetti by Frank Williams (Tuolumne County Official Records 99:174). On July 10th of the following year, Whitt deeded the property to Josephine Rose Armario (soon to be his wife), noting that it was located “where the county road crosses the Sierra Railway, easterly on the railroad houses near the foot of La Cass Hill, situated south of the road, east of the railroad, and between the lands of Sanguinetti and Price” (Tuolumne County Official Records 7:322). Whitt had operated a mill in South Fork for a time before moving to Sonora, and moved much of his equipment from that facility to Sonora (Whitt, personal communication 2011). In July of 1940 Samuel and Josephine (now Whitt) deeded the westerly portion of their five-acre parcel to Duane and Emma Miller for their body shop (Tuolumne County Official Records 7:322, 16:11). In May of 1942 Samuel and Josephine Armario Whitt mortgaged the property to Security Title Insurance Company (Tuolumne County Official Records 19:420), redeeming it in September of the following year (Tuolumne County Official Records 23:226). In 1939 Whitt also purchased a 3.459-acre parcel of land in Section 34, T1N, R15E, north of Standard, mortgaging it to W.M. Baldwin in 1939, but redeeming it in 1941 (Terry 1939; Mortgage Book 27:403, 28:298). Entering the lumber business on a larger scale, in 1944 Samuel and Josephine purchased 300 acres of South Fork timber land located in Sections 26 and 27, T3N, R16E, from Eric and Pearl Segerstrom (Tuolumne County Official Records 25:216-217). In addition, they logged on Forest Service land, as well as other private land, selling to the mills at Confidence, Anderson Lumber Company, and Hales and Symons. With timber rights in hand, they then mortgaged the timber lands, known as the Segerstrom Tract and others; as well as the Baldwin Tract in Section 34, T1N, R15E; and the Sanguinetti Tract, “including buildings or improvements now or to be erected,” plus insurance. The mortgage was for $6,250, with interest, to Fred W. Leighton, acting astrustee for Hales and Symons (Tuolumne County Official Records 23:367). The Deed of Trust was reconveyed in December of the following year (Tuolumne County Official Records 28:175). This suggests that the money was required for the construction of the mill, and that the Whitts were now prepared to begin their business in earnest. Timber included cedar, pine, and fir, and was rough cut in the mill, while bull pine was cut for box and corral lumber. Shooks, box ends, and sides were made in the planing mill and box factory and sold to Stockton Box, Merced Box, Hales and Symons (Irving Symons was a good friend), and others. In addition, survey stakes were produced for the City of San Francisco. From the mid-1950s through the mid 1970s, the plant employed 25 to 30 employees (Whitt, personal communication 2011). They purchased a vintage Caterpillar tractor for hauling logs and began buying up government timber at $3 per board foot, moving a lot of the equipment from a mill in South Fork (Fresno County) that Samuel operated prior to opening the Sonora mill in the mid-1950s. The sawdust burner at the mill was purchased from a mill in Oregon, while that at the box factory was erected by Samuel. According to their son, Wes Whitt, Josephine operated as plant manager, receiving timber from the crews, processing and milling it, grading lumber, payroll, and much more, while Samuel primarily did repairs (Townsend, personal communication 2011; Whitt, personal communication 2011). Over the ensuing years the Whitts purchased and leased various parcels of surrounding lands as their plant expanded. In 1949 Henry and Rose Sanguinetti leased a small portion of their land in the S ½ of the NW ¼ of Section 6 (.04 acre) to Samuel and Josephine, noting that it had previously been leased to Claude Andrews, for $15 a month (to be increased to $30 a month in 1969). They were granted the right to remove earth, rocks, etc. to erect structures (Tuolumne County Official Records 67:204, but not recorded until November of 1954). By 1949, the residence (constructed ca. 1941), as well as several other structures to the east of it, were depicted on a map of the Whitt property (Tuolumne County Assessor 1949). One of these was evidently the residence of Samuel’s step-sister Emma and her husband, located immediately west of the present Clark Pest Control. The other residence on the property was located on the southwest side of the road leading to the sawmill; it was purchased from the Watson family before the mill was erected (Whitt, personal communication 2011). The Whitts also leased portions of their lands to others. In September of 1949, Whitt and Sanguinetti leased a portion of their properties to the Mother Lode Broadcasting Company (Thom 1949). Two years later the Whitt portion of the Price lands was leased to the Associated Oil Company (Record of Survey 11:49). In 1952 Whitt surveyed a portion of the Louis B. Price lands (APN 056-160-040), located southwest of the residence and box factory, suggesting a recent purchase (Stirewalt 1952). Son Wes Whitt recalled that he went to work in the sawmill when he was only 10 years old, cutting 32-foot logs in half, as well as running the forklift, driving truck, and assisting with everything at the plant (Whitt, personal communication 2011). With the operation expanding, in 1961 Whitt leased a 2.81-acre parcel of land from Henry Sanguinetti (Record of Survey 16:13). In 1949 properties east of the residence and box factory (present site of Clark Pest Control) were leased to Dewey Miller who ran a car repair shop, while east of that was Dale Clifton’s Mother Lode Dairy. Clifton sold the dairy business and it shut down shortly thereafter. Samuel died in 1970 and production at the Whitt mill tapered off in the late 1970s and early 1980s after heavy state regulations on logging forced cutbacks in operations (Townsend 2011). In 1983-84, Josephine sold everything but her residence to the Dave Beary Corporation. Beary, a commercial real estate broker, was to build her a new house near Phoenix Lake and established a corporation to invest in the property. But Beary failed to do so and Josephine never got her new home, remaining in her old residence until her death in 1996. Beary died in 2000 and Hary & Associates paid the taxes and acquired the property, selling one parcel to Clark Pest Control. The manufacturing plant property is now vacant and abandoned and has been vandalized. The box factory burned in February of 2007 and was cleared in February of 2011. The property is now for sale.